SIEGE is held at the Atlanta Marriott NW at Galleria. 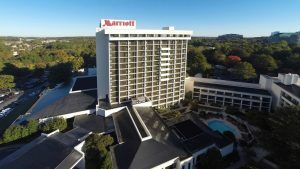 This spacious and private location on the outskirts of north Atlanta allows attendees to have a valuable industry experience without the Atlanta traffic. For those flying in, the hotel is a straight shot from the Atlanta airport. Our venue accommodates the full conference including space for lectures, pitch competitions, panels, eSports tournaments, and industry networking events. Are you bringing a van or bus to SIEGE with 10 or more people? Please inquire about our Clear Air Stipends. Send a message to [email protected]. We begin reviewing applications Sept. 1.